When I don't know what to wear, I wear all black. I've done it on the blog before: with a green coat and with a white blazer, but I've never tried it with a belly the size of a watermelon. I would normally mention how slimming black is, but that's really irrelevant at this point :) But, all black really is the best thing when you wake up late in the morning. Easy. I woke up late this morning because I was up so late every night this weekend. Not because I was livin it up (whatever that means) but because Eric and I worked so.freaking.hard. on the house this weekend. Replacing faucets, putting in fans, installing curtains, cleaning light fixtures, etc. It is SO crazy that we are just a little over a month away from meeting our son. Let's just say that we have A LOT to do before he gets here. As annoying as it was to go back and forth to Lowe's 20x this weekend, it feels so nice to check things off our list! I'll say it again- you're one stylish mama! I have got to get my hands on a plaid scarf this Fall, I love how they look! Sounds like you had quite a full weekend! I spent most of yesterday running around getting things done, I was amazed at how it took up my whole day AND I was so tired after! I'm sure it'll be great to have that all done though. Eeek, baby so soon!! I love the all black! I really need to get or make myself a plaid scarf. I just blogged myself wearing the striped version of this shirt, it is so comfy. Sounds like some serious nesting! I hope it's making you feel calm. 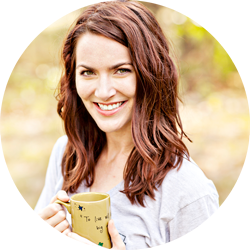 When we have anything going on at our house I go into serious overdrive to complete projects I've been meaning to do - I can only imagine the way that feels when you are trying to get the house ready to bring a BABY home! Also, I love how easy all black is. I wish I could wear it more often. As much as I vacuum and clean, our pet hair problem (three cats, two of which are white, and a dog) is too out of control to really ever wear black. Even if I am just walking through the house to the outside, I feel like fur sticks to me on my way out the door! Such a cute look, maternity or not! Plus, you are so adorable. Visiting from the Let it Shine linkup. All black is such a life saver, isn't it?! And ugh, I know we still have some projects we should be working on, but think I've hit the point where I'm just done. So glad to hear that you had a good weekend of tearing through your to-do list though...that has to be a great feeling!! The all black look is working for you! You are one of those cute pregnancy ladies. You are nesting, that's for sure. We did the same thing. You rock the all-black look! I love this outfit, and especially those lovely boots. too cute love those booties ! I take it by the ebay link that these booties are old? I think I will be spending the next three months deciding what kind of black booties I want (heel v. wedge v. wooden chunk heel v. flat). Anyway. I really like this look, and the idea of going all black when in doubt is such a clever trick! There is nothing like a little baby coming to create motivation! Sounds like you got so much done! I love this look, it is really chic with your glasses! You look so super sleek in this head to toe black though! I'm sure it's exciting to get things done in anticipation for the baby, even if it means a million trips to Lowes. All black is the perfect go to outfit. You are one stylish momma! Sounds like you had a productive weekend! Ashley, you look radiant! Love the way you've done your hair. The aviators, bracelets and the plaid scarf all add interest and fun to the plain black outfit. I love this look! 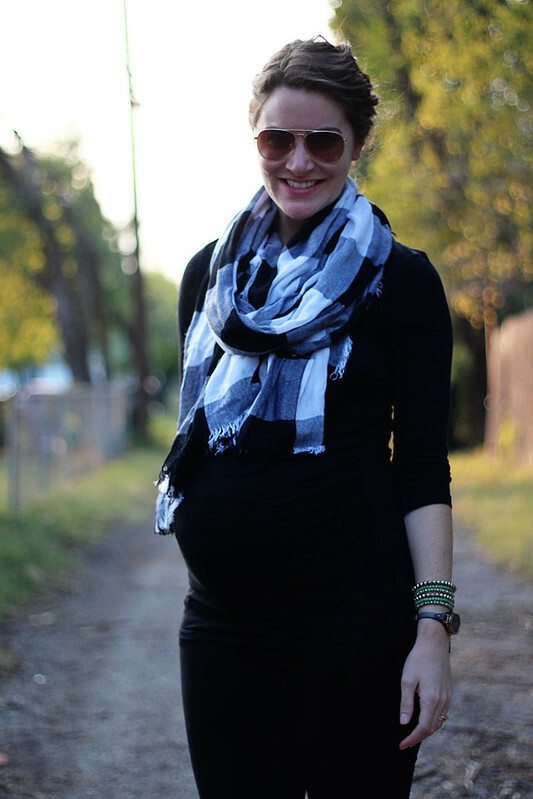 I think wearing all black let's all the other little details shine, like the scarf, booties, sunglasses, and hair! You are just adorable! Checking things off a to-do list is one of my favorite things (no, seriously) so hooray for a productive weekend! way to go getting so much stuff done around the house, thats awesome! love the all black with the scarf, perfect outfit. Love the all black with a plaid scarf. It's a go-to for me too...I have so much of it and and I always feel confident in all black attire! You have looked chic all through your pregnancy and this is no exception. Love the pop of plaid. And big yes for getting so many things fixed at your home. I reach for all black when I'm at a loss too. 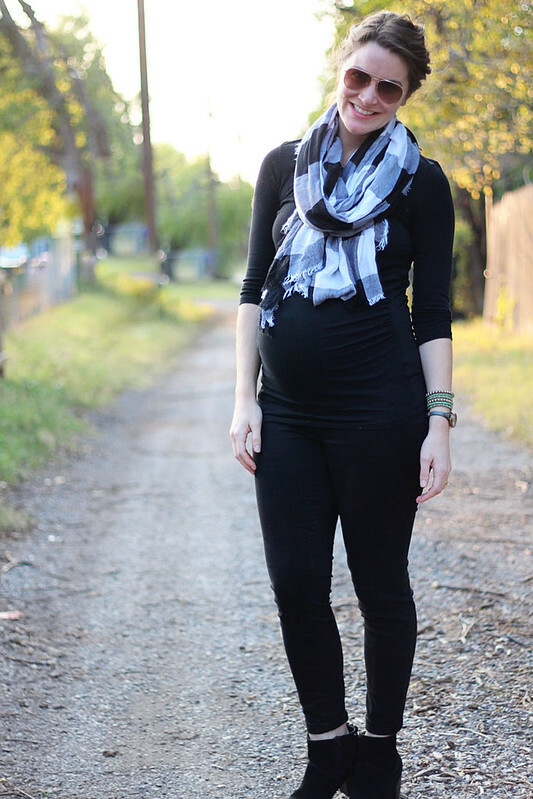 It is perfect maternity wear with your scarf and booties (which I love!). That bump is so adorable! I'm loving the simplicity of this outfit! All black with one statement piece. Easy but still so polished! I bet it feels great to get a bunch of stuff done. It'll be harder when your son comes I'm sure! This is such a great look! You have great style!